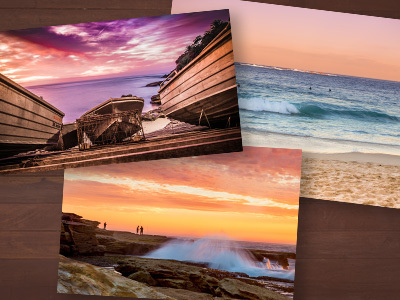 Discover spectacular photography of Sydney's Eastern Beaches captured by local photographers Erin Webster and Glenn Albert. Exhibition on display during library opening hours. Exhibition on display during library opening hours. "Sunrise is the only time of day that stills our busy city. While a peaceful time, it is also transient: arrive 10 minutes late and the day has already begun. The coastline becomes a hive of activity until the sunlight fades and the cycle starts again. By producing these photographs, I want to remind people to take a lesson from nature and still themselves; each new day is a new start." Erin first picked up a DSLR as a tentative novice to capture a three-month holiday through Scandinavia and Western Europe; now she is rarely without one! As she has delved into the technical intricacy of photography, she has been influenced by the expertise of National Geographic photographer's and hands-on time with Sydney based action-photographer Glenn Albert. Erin constantly craves new photographic challenges and this craving has taken her to diverse Australian environments from motor sport at Eastern Creek to a remote cattle station (the latter granting her bragging rights as an exhibitor at this year’s Royal Easter Show). Joining Erin in this collaboration is Glenn, a passionate Motorsport photographer. After photographing the final 6 hour motorbike race at Oran Park Raceway for an online magazine, Glenn began to capture various other forms of sports, Australian Equestrian Championship and Australian Kayak Championship to name a few. Needing more challenges Glenn looked to other subjects to photograph. This lead him to landscapes. Inspired by the challenge of not being in control of the conditions, meant having to adjust to what is encountered in the moment. The Cronulla series saw Glenn awarded, Winner Camden Art prize 2017, finalist Western Digital Top 50 Australia and Commended Australian Photography magazine 2017. To view sample images please head to www.facebook.com/curbsidephotography for Glenn 's photos and www.facebook.com/photographybystudioeau/ or www.Instagram.com/studioeau for Erin's photos.